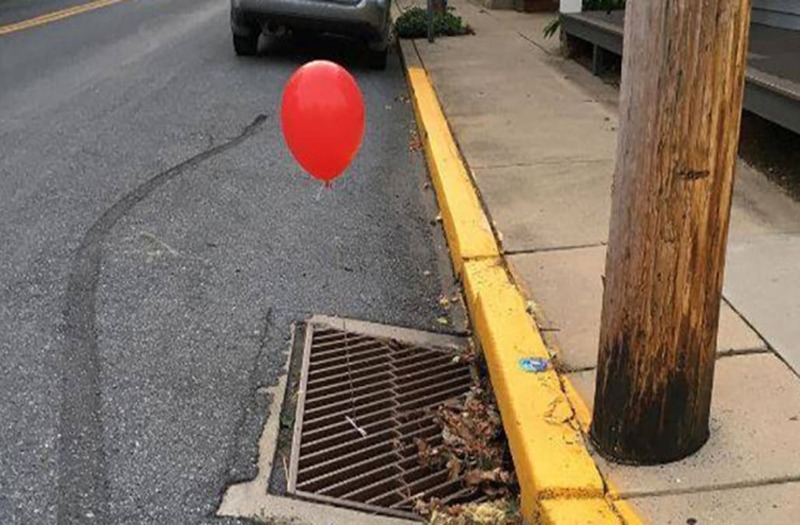 A police department claimed to be “completely terrified” after spotting red balloons tied to sewer grates, similar to the horror film "It," in Lititz, Pennsylvania. Police took to Facebook Tuesday to “respectfully request” local pranksters stop the gag, despite applauding the tricksters for their creative way of promoting the film, which is slated to debut in theaters nationwide on Friday. “We want the local prankster to know that we were completely terrified as we removed these balloons and respectfully request they do not do that again,” the post read. Lights are seen at the set of the post-apocalyptic movie Zombie Era at an abandoned factory complex in Langfang, Hebei province, China December 16, 2016. REUTERS/Damir Sagolj SEARCH "CHINA ZOMBIES" FOR THIS STORY. SEARCH "WIDER IMAGE" FOR ALL STORIES. Broken windows of an abandoned factory complex overlook the set of the post-apocalyptic movie Zombie Era in Langfang, Hebei province, China December 16, 2016. REUTERS/Damir Sagolj SEARCH "CHINA ZOMBIES" FOR THIS STORY. SEARCH "WIDER IMAGE" FOR ALL STORIES. Director Shen Chenyan (2nd R) and executive producer Liu Menghuan (L) watch a scene of the post-apocalyptic movie Zombie Era on the set at an abandoned factory complex in Langfang, Hebei province, China December 16, 2016. REUTERS/Damir Sagolj SEARCH "CHINA ZOMBIES" FOR THIS STORY. SEARCH "WIDER IMAGE" FOR ALL STORIES. Actors wait for their cue in a scene of the post-apocalyptic movie Zombie Era at an abandoned factory complex in Langfang, Hebei province, China December 16, 2016. REUTERS/Damir Sagolj SEARCH "CHINA ZOMBIES" FOR THIS STORY. SEARCH "WIDER IMAGE" FOR ALL STORIES. Crew and actors film a scene of the post-apocalyptic movie Zombie Era at an abandoned factory complex in Langfang, Hebei province, China December 16, 2016. REUTERS/Damir Sagolj SEARCH "CHINA ZOMBIES" FOR THIS STORY. SEARCH "WIDER IMAGE" FOR ALL STORIES. A crew member snaps the clapperboard at the set of the post-apocalyptic movie Zombie Era at an abandoned factory complex in Langfang, Hebei province, China December 16, 2016. REUTERS/Damir Sagolj SEARCH "CHINA ZOMBIES" FOR THIS STORY. SEARCH "WIDER IMAGE" FOR ALL STORIES. Actors rehearse their roles during the filming of the post-apocalyptic movie Zombie Era at an abandoned factory complex in Langfang, Hebei province, China December 16, 2016. REUTERS/Damir Sagolj SEARCH "CHINA ZOMBIES" FOR THIS STORY. SEARCH "WIDER IMAGE" FOR ALL STORIES. A prop from a previous project lies near the set of the post-apocalyptic movie Zombie Era at an abandoned factory complex in Langfang, Hebei province, China December 16, 2016. REUTERS/Damir Sagolj SEARCH "CHINA ZOMBIES" FOR THIS STORY. SEARCH "WIDER IMAGE" FOR ALL STORIES. An actor waits for his scene at the set of the post-apocalyptic movie Zombie Era at an abandoned factory complex in Langfang, Hebei province, China December 16, 2016. REUTERS/Damir Sagolj SEARCH "CHINA ZOMBIES" FOR THIS STORY. SEARCH "WIDER IMAGE" FOR ALL STORIES. Crew members sit at the set of the post-apocalyptic movie Zombie Era at an abandoned factory complex in Langfang, Hebei province, China December 16, 2016. REUTERS/Damir Sagolj SEARCH "CHINA ZOMBIES" FOR THIS STORY. SEARCH "WIDER IMAGE" FOR ALL STORIES. Actors wrapped in blankets react at the set of the post-apocalyptic movie Zombie Era at an abandoned factory complex in Langfang, Hebei province, China December 16, 2016. REUTERS/Damir Sagolj SEARCH "CHINA ZOMBIES" FOR THIS STORY. SEARCH "WIDER IMAGE" FOR ALL STORIES. A crew member carries a phone with a cover at the set of the post-apocalyptic movie Zombie Era at an abandoned factory complex in Langfang, Hebei province, China December 16, 2016. REUTERS/Damir Sagolj SEARCH "CHINA ZOMBIES" FOR THIS STORY. SEARCH "WIDER IMAGE" FOR ALL STORIES. Props are seen at the set of the post-apocalyptic movie Zombie Era at an abandoned factory complex in Langfang, Hebei province, China December 16, 2016. REUTERS/Damir Sagolj SEARCH "CHINA ZOMBIES" FOR THIS STORY. SEARCH "WIDER IMAGE" FOR ALL STORIES. Actors eat lunch at the set of the post-apocalyptic movie Zombie Era at an abandoned factory complex in Langfang, Hebei province, China December 16, 2016. REUTERS/Damir Sagolj SEARCH "CHINA ZOMBIES" FOR THIS STORY. SEARCH "WIDER IMAGE" FOR ALL STORIES. Crew members work at the set of the post-apocalyptic movie Zombie Era at an abandoned factory complex in Langfang, Hebei province, China December 16, 2016. REUTERS/Damir Sagolj SEARCH "CHINA ZOMBIES" FOR THIS STORY. SEARCH "WIDER IMAGE" FOR ALL STORIES. "If you're not sure what we're talking about, search "It" and watch the preview, but we suggest watching the preview with a friend or coworker with all the lights on and the sound down low," the post continued. "You'll float too." The upcoming horror flick tells the frightening story of a sewer-dwelling clown, Pennywise, who terrorizes a group of preteens in the fictitious town of Derry, Maine. Pennywise is often seen carrying a single red balloon and inviting children down to the sewer. “We all float down here. You’ll float too,” the spooky clown told the children in the original 1990 film adaptation.